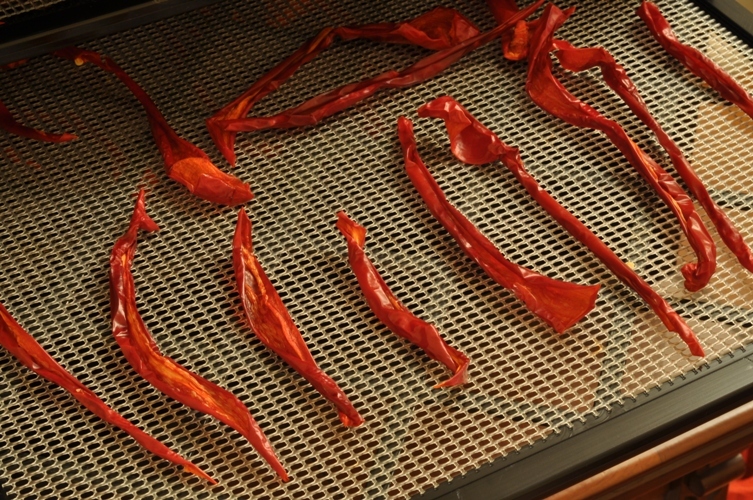 Dehydrating is a great way to preserve the season’s bounty especially when time is tight. Last year we purchased the Excalibur 3926T and have enjoyed using it to put up peaches, apricots, bananas, strawberries and an assortment of hot and mild peppers. It’s quick and easy and relatively fail proof (even our over done apricots could have been resurrected but instead became Gussy snacks – Gus is the youngest of our three Labrador Retrievers). 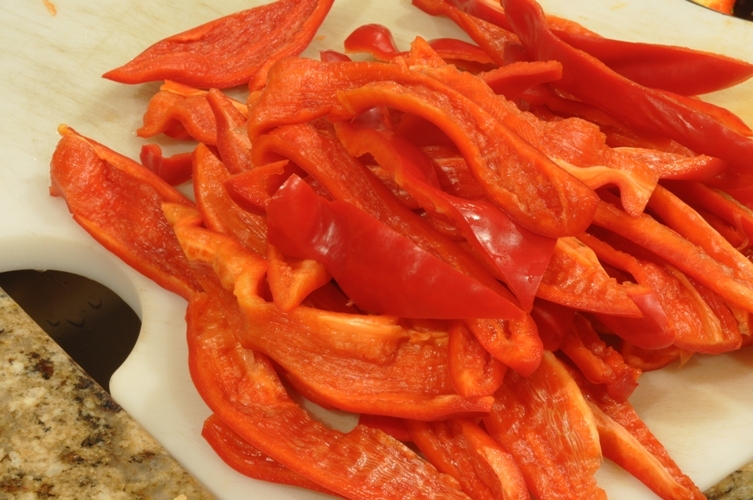 The day before my departure for the “big baby boy birthing event” I discovered a drawer full of red Sheppard peppers I’d forgotten about in the fridge. Now, things are a little blurry (lack of sleep, baby excitement and all) so I don’t recall our original plans for these beauties but with a limited amount of time I opted on dehydration. It’s so easy I feel kind of ridiculous for outlining the steps below. The only thing to watch is the amount of time you leave them in your machine, as it’s better to under do it and add more time, than to end up with a bunch of Gussy snacks. We originally set the timer for 8 hours and added a couple more hours after checking them the next morning. The thicker peppers were still a little soft and squishy in the middle but a few more hours did the trick. Store in a glass mason jar. wow! I dream of an Excalibur someday. Are you happy with the performance? How loud is it? Yes, we love it! It makes simple work of a large amount of food. I’m not sure how to rate the volume or what to compare it to – the dishwasher or microwave? It makes a constant humming sound…we have it in a room off our kitchen. But with the timer you can set it and walk away so it can be on throughout the night or when you’re at work. 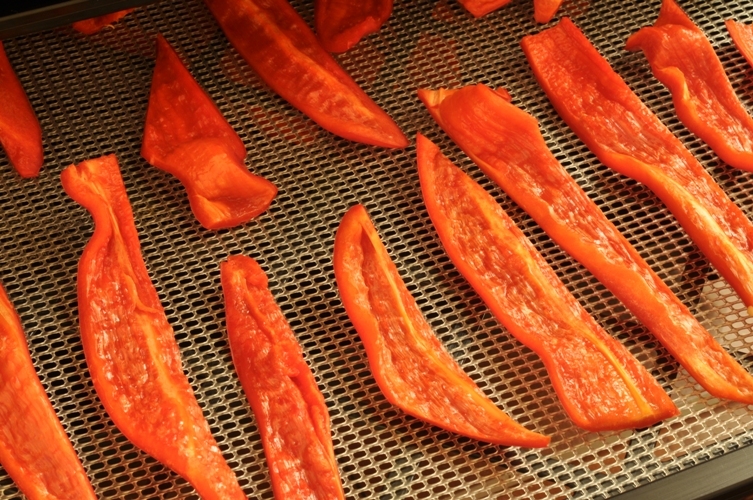 SO glad to see you doing a bit about dehydrating! We bought an Excalibur 3900 a few weeks ago and we love it *SO* much that we bought a 3926T a couple of weeks later (we now have two dehydrators). 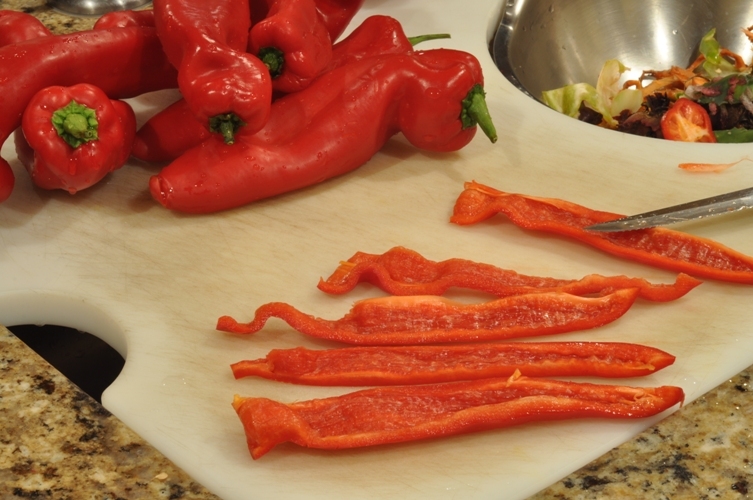 We have been dehydrating *SO* much local produce (our garden didn’t do so well this year). LOVE LOVE LOVE the Excalibur!! !